At Burger Mondays, we pride ourselves on our dedication to quality, scratch-made, culinary creations. 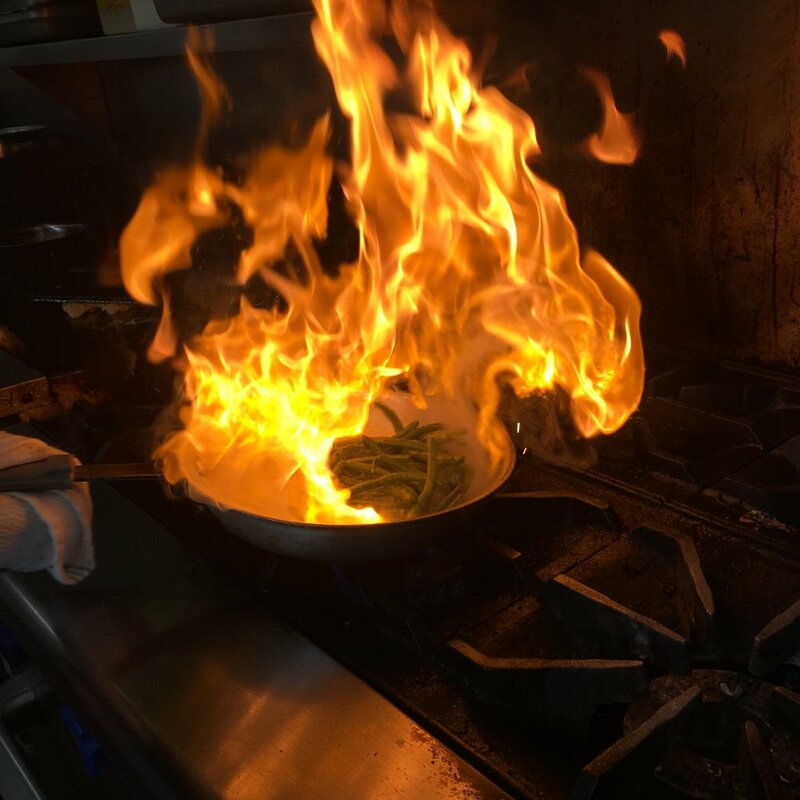 From our mouth-watering burgers to Chef Matt's innovative specials, we are always taking the extra step to ensure our customers have an unforgettable dining experience each and every time they visit. Our trendy atmosphere and attentive service are unmatched and our bar/lounge is a great place to unwind for a drink with family and friends. We look forward to seeing you at Burger Mondays! To access our "secret menu", specials and other promotions make sure to download our app. Available on the Apple App Store & Google Play. Burger Mondays Bar & Grille, the creation of Matt and Suzie Jones, is a casual, upscale, made-from-scratch burger joint that serves more than just burgers. We opened in February 2011 in our hometown of Binghamton, NY. We chose the downtown area to help contribute to its revitalization. There were only a few places to eat downtown when we opened and now there are dozens. Prior to opening Burger Mondays, Matt worked as the executive chef at Number 5 Restaurant, a steakhouse in Binghamton. During football season a group of our friends would gather at the bar for the Monday night game and each week someone would be tasked with bringing in burger ingredients. Matt would make a different burger each week for the group. This weekly gathering sparked the idea for us to open our own place. It has always been a dream of ours to own our own business. The name Burger Mondays is a nod to this weekly Monday burger gathering. The fact that we came up with the concept, built it, created the menu options, and have been successfully operating the establishment, has been very satisfying for the both of us. Matt, who is also the restaurant’s executive chef, created the entire menu. We take serving high quality food seriously and describe our menu as "fine dining on a bun.” The burgers are made with a special blend of fresh ground meat that is hand-pattied. The house-made sauces add a unique flavor. The burgers are paired with fresh hand cut fries and a house-made pickle. There are daily specials and we often take custom requests. If we have the items on hand, we will make it. Our drink mixes are also made in-house and change with the season. The most popular menu items are the Classic Burger, Philly Cheese Steak Egg Rolls, Calamari Salad, Ahi Tuna Burger, and the Delmonico Steak. Matt’s favorite burger is his namesake, The Jonesy. It’s made with a double-stack of pork and beef, caramelized fennel, chili pepper salad, pancetta, asiago cheese, Worcestershire reduction and housemade aioli. We also offer catering services to include fine dining style, multiple course weddings and private parties (both on- and off-site). We work with clients to create a custom menu for each event based on client tastes and preferences. We are also developing a line of bottled, custom-made sauces for retail. Matt is a classically trained chef who, before opening Burger Mondays, worked at Number 5 Restaurant as their executive chef. Matt has brought that fine-dining flare to Burger Mondays with his focus on scratch-made, creative culinary creations. Yes, Matt creates the best burgers in Binghamton, but his experience and skill as a chef are apparent in all aspects of the Burger Mondays menu. You can taste the freshness in each bite, which can be attributed to Chef Matt's quest for absolute quality ingredients, many of which come from a local, organic farm that partners exclusively with Burger Mondays!